Around the year 1984, Hasbro toys, the makers of the toy lines "G.I.Joe," "My Little Pony," and "The Transformers," began production of three theatrical movies based upon these three popular toy lines. The Transformers: The Movie, was produced by Sunbow and Marvel Productions and was animated in Japan by Toei Animation - a Japanese animation company founded in 1951 and credited for being one of the first popular Anime studios. The movie's story takes place in the year 2005, approximately 20 years after the first few seasons of the TV series, and introduces a new batch of characters to replace and/or supplement the original characters. It was released in 1986 in U.S. theaters by the Italian film distributor De Laurentiis Entertainment Group (DEG). The film was directed by Nelson Shin, whom also produced the Transformers television series. Shin's credits include the animation for the Pink Panther films, animating the laser sword for Star Wars, and involvement in production of more than 1000 episodes of animated films. He is presently the Chairman and CEO of AKOM Productions, an animation studio in Seoul, Korea. The movie features such celebrity voices as: Eric Idle (of Monty Python fame), John Moschitta Jr. (the Micro Machine guy and world's fastest talker), Leonard Nimoy (Spock from Star Trek), Judd Nelson (The Breakfast Club, St. Elmo's Fire), Robert Stack (Unsolved Mysteries, Airplane!, Beavis and Butthead do America), Lionel Stander (Hart to Hart), and Orson Welles (legendary filmmaker of Citizen Kane and Touch of Evil). The soundtrack features the musical score of Vince DiCola, whom had previously scored Rocky IV, with songs by Stan Bush, N.R.G., Spectre General (a.k.a. Kick Axe), Lion, and even a track from "Weird Al" Yankovic. My Little Pony: The Movie was released first of Hasbro's three toy-line-based films, and featured the voices of Danny DeVito and Cloris Leachman. Both it and The Transformers: The Movie were released in theaters, and were considered financial bombs. Because of this, the decision was made not to release G.I.Joe: The Movie in theaters, but to release it directly to video. G.I. Joe featured the voices of Don Johnson and Burgess Meredith, and was also written by Ron Friedman and produced by Toei. The Transformers: The Movie was released theatrically in the United States on Friday, August 8, 1986, on only 990 screens. It grossed $1,779,559 its opening weekend, and ranked 14th place at the box office. The next week it grossed below $1 million, making it drop off the box office list. To people like myself who don't normally follow movie grosses, that is considered a "bomb." The #1 box office smash movie at the time was James Cameron's Aliens, which pulled in $5,779,352 during its third week of release alone. As a sad note of trivia, Howard the Duck, already in its second week of release, grossed $2,719,620 that weekend, ranking six places higher than TF:TM. According to the Internet Movie Database, the film earned a total of $5.849 million in the USA - a higher number than the one above. This probably includes the profit from video sales and rentals. The movie was released in 1986, at which time the animation industry was in a slump. Even Disney had its share of box office failures at the time, such as The Black Cauldron (1985). The reviews were not all that favorable. Many critics warned parents not to take their children to see it due to use of profanity and violence. The movie was released in a very small number of screens, on a limited number of days. Advertisement for the movie was fairly limited. Commercials and trailers were geared towards the fans, not the theater-going public. The August 8, 1986 issue of The Chicago Tribune states that The Transformers: The Movie "has all the makings of a traditional science-fiction cult classic movie." 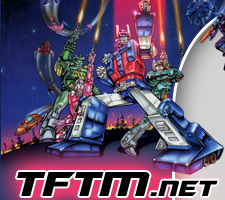 Even though the movie did poorly financially and was panned by most movie critics, to myself and millions of fans it remains an example of a film that is truly "more than meets the eye."